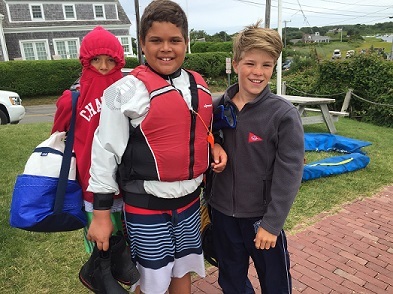 The SHSS sailing program has been successful for almost 90 years in teaching students to sail, forging lifelong friendships and enjoying summer days on Stage Harbor. The program is best experienced when students attend class regularly and for as many weeks as possible. This allows students to master the skills taught at each level and to develop strong friendships. The Sailing School curriculum and schedule follow a general approach: instructional classes meet in the mornings, and more specialized classes meet in the afternoons. One exception to this morning/afternoon split is for Seamen, whose specialized Opti class meets on Tuesday mornings. The general instructional classes: Hermits, Seamen, Mates, Old Mates and Skippers, all have on the water instruction two mornings a week. Additionally, Seamen, Mates and Old Mates meet for Shore School on Wednesday mornings. The specialized classes: Optis for Mates, Optis for Old Mates/Skippers, 420 Race Team, O'Pen Bics and Adventure Sail meet in afternoons (frequency depends on the class). Optis for Seamen and Introduction to 420s (for Skippers) meet one morning a week. Students must be registered in one of the general instructional classes in order to participate in a specialized class. 420 Racers who have completed the sailing program, or the equivalent elsewhere, may sign up just for 420 Race Team. We encourage students to register for both general and specialized classes when possible. The more time students spend on the water, the more comfortable they become as sailors as their mastery grows. Time at the Club also allows students to make important friendships. Specialized sailing is not just about racing! For those students who begin their experience with SHSS as a Hermit or Seamen, the classes follow a progression based on age, experience and advancement testing. For those students who are new to SHSS and who may also be less experienced and older, please contact the Program Director, Chris Beard or Sailing School President, David Leary, before registering to discuss your child’s correct placement. Optis for Old Mates students may signup also for Adventure Sail in place of Monday's Opti class. Students participating in Optis for Old Mates may signup also for Adventure Sail in place of Monday's Opti class.